"I love this painting of Sir Donald our commander in chief and patriot Trump picking up our flag, holding it to his heart with supreme love and determination on his face, gently wiping the sediment of war from her stars and stripes, so she, while wounded, can continue to be our gallant symbol of liberty, pride and freedom as we the people united with our president strive to defeat the plague of communism seeking to engulf us and all future generations." 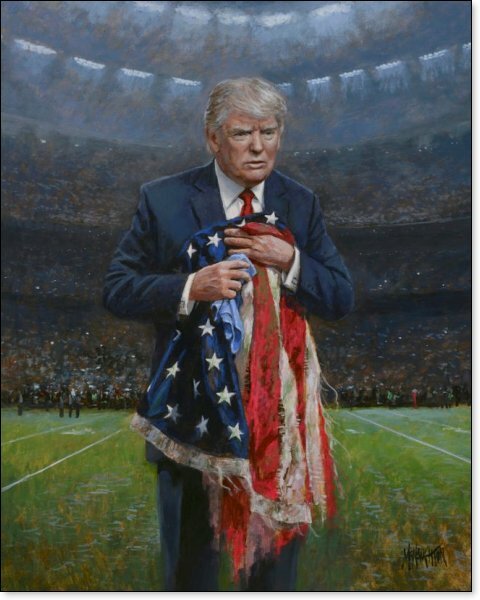 The gifted artist who created this image of President Trump, Jon McNaughton, was inspired by the NFL's ugly protests against the American Flag when The National Anthem is played before their games, the flag under which they all became famous multi- millionaires. Strange protests indeed. Nuts if one wishes to be precise. This is what led portrait artist Jon McNaughton to place his subject in the middle of a football field, titling the work, "Respect the Flag." The love and respect President Trump's face and body posture displays as he clutches the American Flag over his heart says it all.